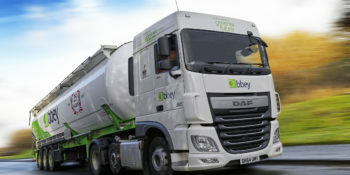 As one of the UK’s largest powder road tanker companies, Abbey works very closely with customers to understand their requirements and build solutions designed to improve the efficiency of their supply chains. Earlier this year we were asked to design and build a reformatting facility to transfer bulk one tonne bags of plastic granules into bulk tankers. Through this new facility, we would eliminate a stage in our customer’s supply chain, reduce mileage and reliance on a third party. 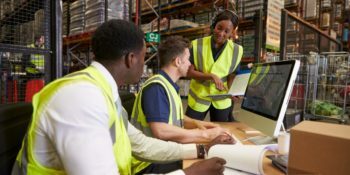 Abbey Logistics operations manager John Abbott began the process of identifying the requirements and designing a procedure with the necessary equipment, in a separated area at Abbey’s warehouse facilities in Bromborough on the Wirral. The new facility needed to adhere to Abbey’s strict health and safety requirements and due to the nature of the product, Abbey had to ensure zero spills or waste and strict contamination controls. In October, the first one tonne bags arrived at Bromborough and John’s team started testing the new equipment which included a new forklift truck strong enough to lift the one tonne bags of plastic pellets, and a new specially designed forklift attachment and stainless-steel hoppers which allow us to easily and safely load our tankers. Once the process for filling the tankers was successfully signed off, the new operation launched, loading more than 100 tonnes of plastic granules in the first week. “Our big bag discharge system enables us to offer our customers more choice in delivering bulk powders across the UK and Europe. “By transferring bagged product of any weight into bulk tankers, we can provide customers with the flexibility to source or manufacture dry bulk products in bags, whilst being able to deliver in bulk road tankers.